The New Jersey State Police Missing Persons unit and Port Authority N.Y. & N.J. Police Department are seeking the public's assistance with identifying this unidentified male discovered deceased in the Hudson River. Unidentified deceased male, 45-50 yr. old, white male, 5'5", 151 lbs., blue/green eyes, salt and pepper shaved head, scruffy beard, missing upper teeth, and no scars or tattoos. He was wearing black Speedo swim shorts, blue t-shirt and black Nike sneakers. 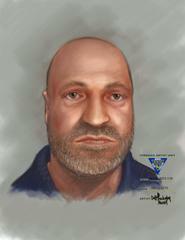 Anyone with information that can assist in helping to identify this unidentified deceased male, please call the New Jersey State Police Missing Persons Unit at 609-882-2000 ext. 2857 or Port Authority N.Y. & N.J. Police Department at 212-502-2514.